Poll takers will select their answer and submit it to see the results of the poll. 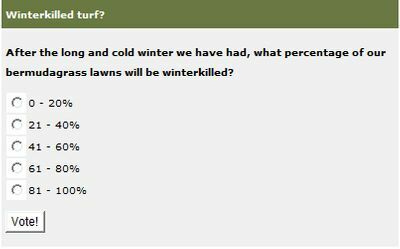 Results from polls are displayed after voting and you can select to display just the percentages, or the perentages and the actual votes for each potential answer. 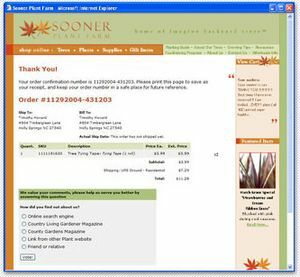 Sooner Plant Farm has incorporated the online poll tool after checkout to find out where their customers found out about them. This helps them to adjust their marketing expenditures. Quickly create an an online poll to get feedback from your site visitors/users. Getting users to interact with your site by answering a question and reviewing results gets them to stay on your website longer and gives you more opportunity to help increase brand preference or to answer your call to action. 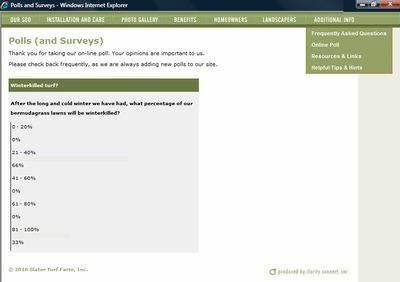 The Online Poll Creator is a quick, easy and cost effective way to add interactivity to your site while gathering valuable information. The tool allows you to choose to display the results of the poll or a simple "Thanks for voting" message. You will also have the ability to publish a poll to a specific page of your website. For example, you could have the "How many children do you have?" poll on your home page and a "What is your favorite color?" survey published on a different page of your site. This is particularly useful when you have a "public" and "private" section of your site and you want to be able to get feedback from those distinct user groups. Finding out where your customers heard about you helps you focus your marketing expenditures on the most profitable channels. You can use the Online Poll Creator to do that. We have integrated the poll into the check out process for some of our clients. After completing their online purchase, the customer can answer a quick "How did you hear about us" type of question.